Batman V Superman: Dawn Of Justice’s interpretation of the Dark Knight was decidedly more brutal and violent than even Christopher Nolan’s dark and serious Batman, but to make his war against crime a bit more effective (and a bit more literal), he really could’ve used some more guns. 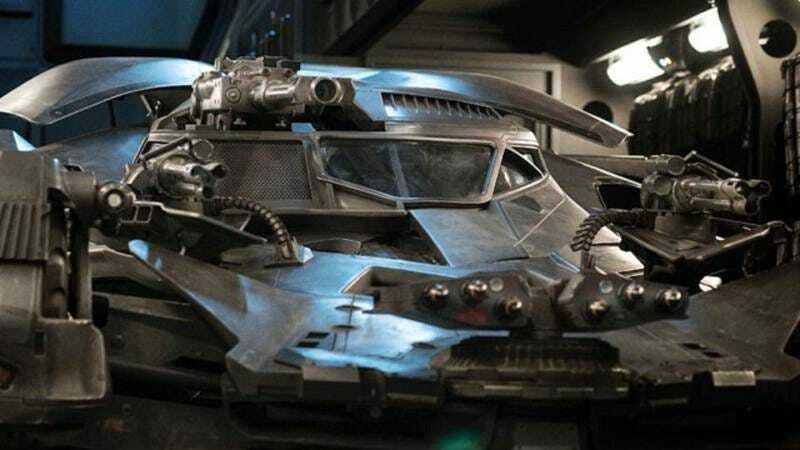 Batman doesn’t typically use guns at all, but while the Batmobile in Batman V Superman was decked out better than most tanks, Batman was only able to kill a handful of henchman with it before Superman rudely trashed the car. We previously got a glimpse of the new car in the Justice League trailer and saw a preview image of the car’s weaponry a few months ago, but this gives us a slightly better look at the new cannons and missile launchers that Batman will be using in his crusade to make sure that no other children ever have to watch their parents get gunned down in an alley. Oh sure, Batman and the rest of the Justice League will be fighting Parademons from Apokolips in the movie, but Parademons probably don’t have children, loved ones, friends that they care about. They look scary and they’re trying to take over the Earth or whatever, so Batman might as well rip them to shreds with his sick machine guns.